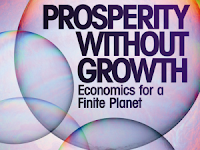 Last night I went to the packed book launch of Tim Jackson's Prosperity without Growth: Economics for a Finite Planet (published by Earthscan). Jonathon Porritt, who introduced the author, declared we were there to celebrate the absence of a question mark. We've gone from questioning whether the growth model works to asserting that it doesn't. I've not read the book yet but it looks extremely interesting. The idea of economic growth is a given in most circles. I don't remember the last time a mainstream politician questioned the fundamental place growth has as an indicator of economic health. However, growth comes at a real cost and what benefits growth does deliver it delivers unequally. The gap between the richest and poorest nations is greater now than it was thirty years ago not just because the wealthy are advancing more quickly but because the rich are rich on the backs of the of the poorest. As Prashant Vaze points out in his The Economical Environmentalist the flights alone of the wealthiest ten percent of the UK population contribute more carbon to the atmosphere than the entire emissions of the poorest UK citizens. When we look at Gordon Brown's call for increased consumer spending and freeing up the ability of banks to lend again as a solution to the current financial predicament there seems to be a real disconnect between these short termist attempts to get back to business as usual and the long term problem that we are a debt ridden society where we are live beyond our means. If anything his solutions are about deepening the fundamental problem, not addressing it. Add to this the fact that unremitting growth is not ecologically sustainable and may lead to catastrophic consequences for millions of people around the world, we have a ticking time bomb whose main victims are the poor. It seems to me that a different kind of economics is required. The catch all term growth does not differentiate between useful production, anti-social financial gambling or meaningless digging and filling in holes. As Chris Harman pointed out in last month's Socialist Review "much, if not all, of the growth of the British economy over the past decade and a half has been non-growth... a minimum of scientific scrutiny shows that GNP does not measure people's wellbeing." That's Jackson's argument. Prosperity "transcends material concerns. It resides in the health and happiness of our families. It is present in the strength of our relationships and our trust in the community. It is evidenced by our satisfaction at work and our sense of shared meaning and purpose. It hangs on our potential to participate fully in the life of society. "Prosperity consists in our ability to flourish as human beings – within the ecological limits of a finite planet. The challenge for our society is to create the conditions under which this is possible. It is the most urgent task of our times." While we feel bound to measure our success as a society by the amount we consume regardless of whether that consumption leads to a greater quality of life (sometimes it does, sometimes it doesn't) or whether we're consuming tomorrow's resources today we'll be trapped in a vicious cycle that's neither ecologically nor economically sustainable. It's time to reassess what it is that we value outside the narrow confines of conventional economics. It's our set text at the next Serious Book Club, Jim. Be good to see you there. Jim, GDP per capita over the world as a whole is about 4k per head. In other words even if all of the goods and services that the world is currently capable of producing were distributed equally, each person would consuming a small fraction of what a low paid british manual worker lives on. Talking about prosperity without growth is disingenuous. Gudrun, doh! I knew that - somewhere in my typing brain the two got switched over. I've corrected that and added in the link you requested. Incidentally Earthscan seem to be publishing some really interesting books at the moment! Reuben, I think you've missed the point a bit. A large proportion of what the economy does is either bad or unnecessary. I'm saying that we should focus on quality of life rather than our current focus on accumulation - no matter what is being accumulated. EG selling lots of cars in the UK means UK people have more cars per head and GDP rises. That's not actually better than having an A1 public transport and local access to decent amenities where far fewer cars are sold, even though the 'contribution' to growth is far less. Also, I didn't mention due to space there was a really interesting question about the developing world which the author responded to by saying that a lot of what he's talking about can help free up space for vital growth in nations where a little bit more would make a massive amount of difference (unlike here). Jim, I think what I was trying to say was, we may not be worthy of your mighty intellect, but you are welcome anyway!